The number of new cars sold that had DAB digital radio offered as a standard option reached 80% in the final three months of 2015. Data from industry analysts CAP and The Society of Motor Manufacturers and Traders (SMMT) for the final quarter of 2015 shows that the percentage of new cars sold that were fitted with digital radio as standard grew to 80.1%, compared to 7.5% five years ago and 61.2% year-on-year. This is the second biggest quarterly increase since monitoring began in 2010. Reinforcing this significant market shift, a further 7% of all new cars had digital radio as an additional option, taking the total proportion of new cars sold with digital radio in the final three months of 2015 to just under 90%. New figures have revealed that 40% of new commercial vehicles sold in December 2015 had DAB digital radio fitted as standard. The figure is up from 28.3% year-on-year. In March 2016, the choice of national stations on DAB will greatly increase to 40 with the launch of the second national DAB network, currently undergoing test transmissions across the country. The so-called "SDL National 2" multiplex (Sound Digital) will additional services including Jazz FM, Share Radio, Virgin Radio and talkSPORT. 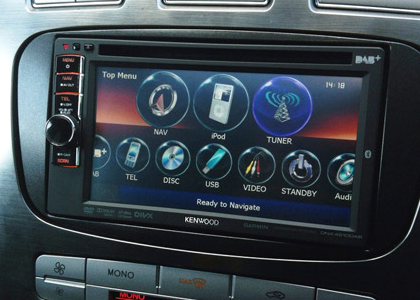 Listeners with digital radio in their vehicle can enjoy these stations and more as well as coverage of this summer’s major sports events - the 2016 UEFA European Championships in June and the 2016 Rio Olympic Games in August. 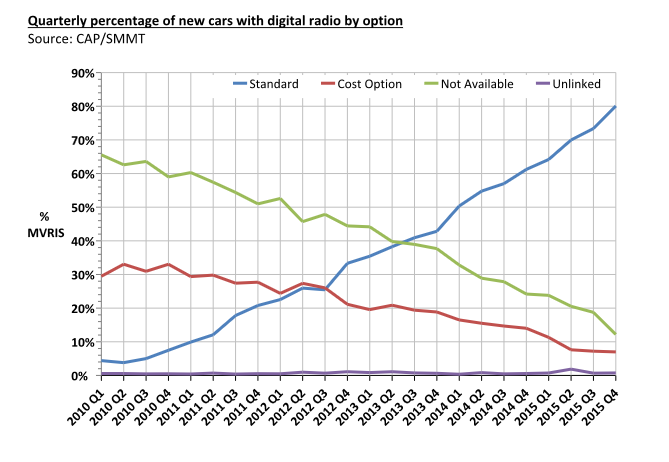 This chart shows how the number of new cars sold and fitted with a DAB digital radio - either as standard or as an extra cost option - has increased in the past five years. Critics of DAB claim these figures are flawed, pointing to the fact that most of the cars sold only offer DAB as standard on the most expensive of the models within a particular range on sale. 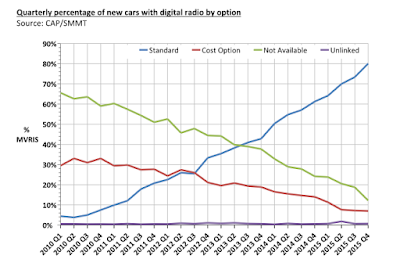 However, the official figures confirm that of those cars actually sold and newly registered, only a small minority of new car buyers stuck with models that had analogue radios, or didn't pay for the cost option on those models where DAB is extra: just over 12% were analogue only - down from around 66% of cars five years ago. While the latest figures will be welcome news for broadcasters and the Government, it shows there's still some work to do before enough vehicles are digital, especially vehicles just a few years old, meaning there's still a market to convert older car radios to DAB, especially if, as expected new services like Radio X and yet-to-launch digital stations continue to whet public appetite for digital radio. It is staggering how long it has taken the auto industry to fit DAB as standard. I really don't understand it. I am sure the lack of leadership from Ofcom, has not helped, but I don't think we can lay the blame at their feet this time. Perhaps the awful sound quality from anything below 128kbps might be the reason!